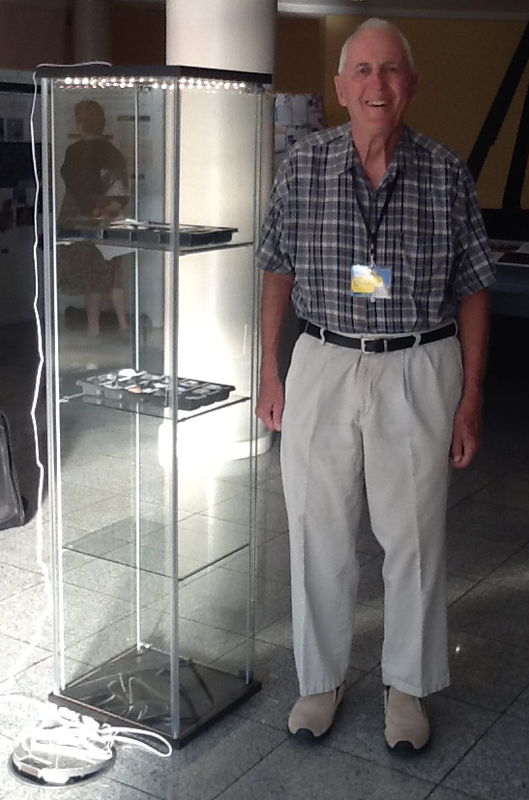 Bob Bruner is a local Mars Society member and long-time supporter of Mars exploration and volunteer at DMNS, whose incredible collection is also documented in the Life on Mars in a Box part of our website. Read below for Bob’s story on how his collection came about and what he has been up to. In addition to this, I donated 750 books and other media collected over a lifetime on the subjects of the Origin of Life and Life on Mars worth over $40,000 to the Denver Museum of Nature and Science and the Lowell Observatory in Flagstaff, Az.. I donated meteorite collections worth over $5000 to the Denver Museum of Nature and Science, the Discovery Museum in Colorado Springs, Co, the NASA Challenger Learning Center in Colorado Springs, Co, and the Lowell Observatory in Flagstaff,Az. I joined the NASA Mars Exploration Program Analysis Group, the International Society for the Study of the Origin of Life, the NASA Astrobiology Roadmap team, and the Mars Society for which I wrote three blogs. I was nominated for the Annie Maunder Medal of the Royal Astronomical Society of the UK (did not win), received commendation letters from the Chief Scientist of the ESA Exomars 2020 rover and the head of NASA (Charles Bolden), and received an award at the ESA Astrobiology Conference in Athens, Greece. I did all this from ages 75 through 80 with no scientific training. I studied finance and investments in college, got my MBA in 1963, was an investment analyst for Hamilton Fund, a systems analyst for Mountain Bell Telephone, a tax analyst for the IRS, and have been retired for 18 years. I paid for my own specimens for my exhibit and my own travel expenses around the world. I am passionate about the search for life on Mars, ever since my father arranged for me to travel to the Yerkes Observatory in 1948 and have a look at Mars through the largest refracting-type telescope in the world with one of the most famous astronomers of our time, Dr. G.P. Kuiper of Kuiper-Belt fame. After the meeting in Leicester, UK last month, the conference chair, Dr. Bridges, requested I leave some of my mineral specimens for them to analyze and build a Raman Spectrographic profile for when the Exomars 2020 rover is on Mars in 2021. That rover will be the first to drill down two meters under the surface and bring up samples to be studied for signs of life. This entry was posted in search for life on April 1, 2019 by rmms.